Our new car enables Namine to be a little more independent. Before I talk about our new car and all the excitement that that entails, let me back up a bit. When we got rid of our car, we decided to lease instead of buy. Namine’s equipment needs have been ever-changing, and we simply can’t know what she’ll need any number of years from now (so we thought then, and so we think now). We had gotten a Ford Edge, a nice SUV with plenty of room in the back for Namine’s wheelchair and walker. 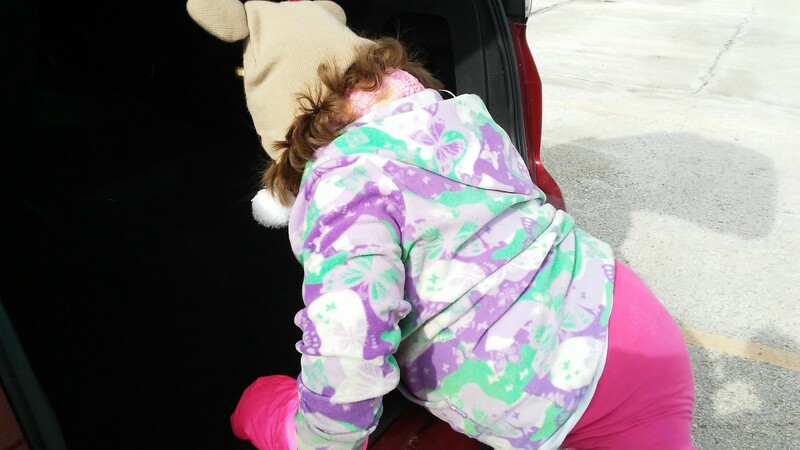 It was certainly easier for her to climb into than the car, but it was a constant learning process. 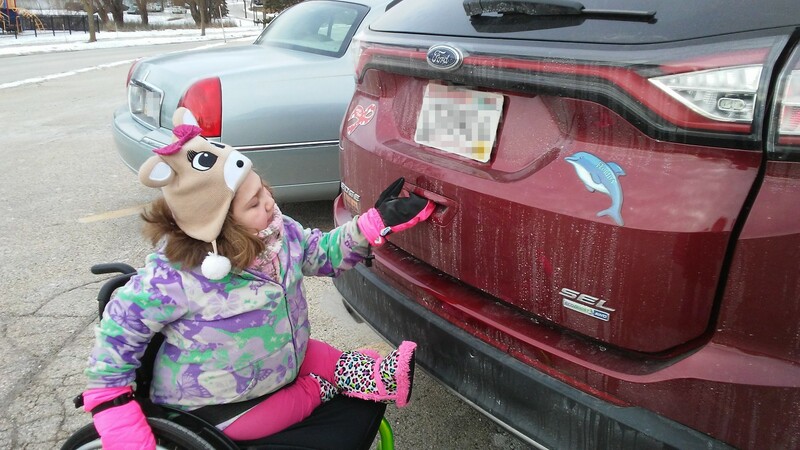 She’s had to figure out for herself the best way to transfer from her wheelchair to the car, and once in the car, into her seat. Since our lease was up, we decided to stick with the same model, just a newer year. We’ve noticed that it’s a little bigger; this is a good thing for us because Namine’s wheelchair has been elongated a few times already. She won’t get a new wheelchair altogether for several years, so we don’t yet need much more room. The new vehicle is also a little lower, which makes it easier for Namine to transfer from her wheelchair into the back. We keep one seat in the back down so that she can get from the back to her seat and buckle up. She no longer needs a child car seat, so there’s no longer anything she needs to climb over. 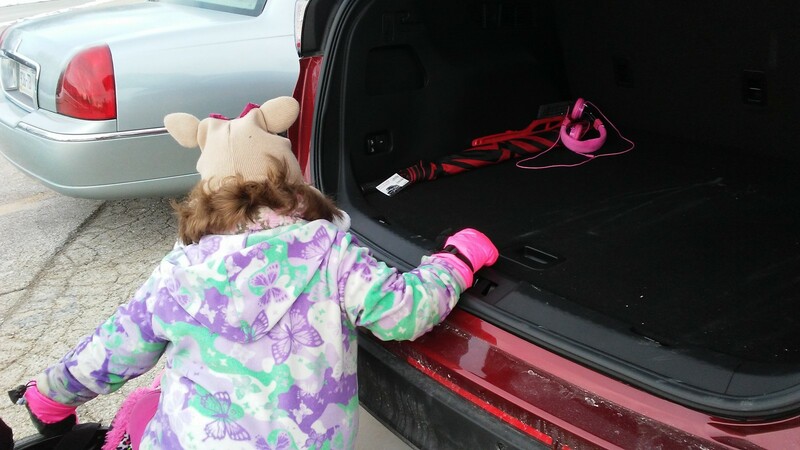 Climbing into a car with mittens on is a challenge, but not an insurmountable one. Probably the nicest thing about the new vehicle, from an accessibility standpoint, is the lift gate in the back. This model’s back door is mechanically assisted, meaning that Namine can wheel up to the back of the car, push the button and, after the door opens, climb in and buckle up. All Jessica or I need to do is close the door, which we’d have to do after putting her wheelchair in anyway.